If you want only local SSH access, you can add a network adapter to the VM and set it to use a 'Host-only Adapter. ', and set a local virtual network interface to use. Under File -> Preferences -> Network -> Host-Only Network, you can fiddle with the virtual interfaces and enable a DHCP server. Now when the VM starts up, you can SSH into it by accessing it by its host-only adapter IP address without exposing it to the network. but you cannot get out of that without killall socat from a different terminal. With your solution I can hide that fact somewhat. 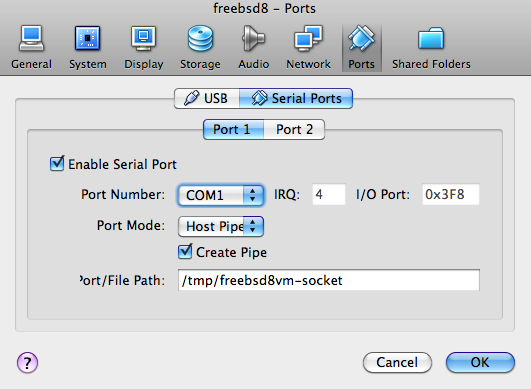 Question: With VBox 5 I seem to no longer be able to boot up FreeBSD with only a serial console, disabling boot messages on VGA completely. It gets stuck right after starting rc, halfway through an echo command strangely enough. Any experience with that?